Believe it or not, this is the site of great productivity. I had some Stampin' Up! friends come for a full day of stamping yesterday. Rae Anne was working on Build-A-Bear, Deana was scrapbooking, Shirley was using aluminum cans in the Big Shot and I was working on something top secret ;-) You can see it involves glitter, but I will wait to tell you more until I have my project ready. My Stampin' Up! groups Lovenstampfuls and ImPECKable Stampers are hosting a Spring into Stamping event for demonstrators (let me know you if you are thinking about becoming a demo and join us!) in a couple of weeks and this is for a demonstration I am doing there. I am pretty excited about this idea... I only wish my ideas would come to me a little sooner! 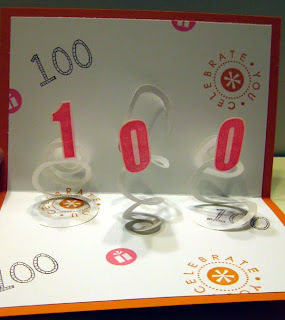 I don't actually know the 100 year old, but I am happy to make a card for a friend to give to someone who is celebrating a milestone like this one! My friend understandably wanted something a little more than our normal cards for her aunt, and I had fun planning this bigger, pop-up card. 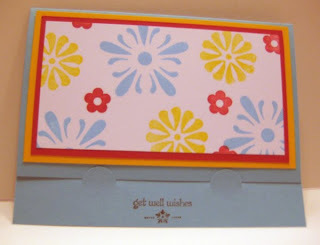 I used a retired Designer Series Paper because it goes so well with one of my favorite stamp sets, Crazy for Cupcakes. I also used some retired alphabet sets because I liked the "festiveness" of the letters, but any set you might have would do the trick. The inside pop-up is easy to do. Use the 1 3/4 inch circle punch to punch a circle that you then just cut around in a spiral. 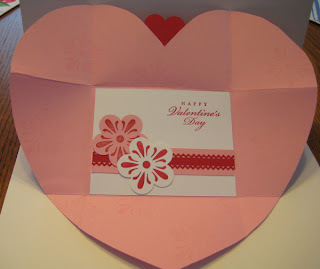 Use 2-way glue to attach the ends to the top and bottom of the card and you have a springy pop-up. Everyone I know is tired of winter - too much snow and too cold for too long. So if we can't be someplace warm, we can at least pretend for a minute. Imagine one of these fruity drinks on a beach somewhere! 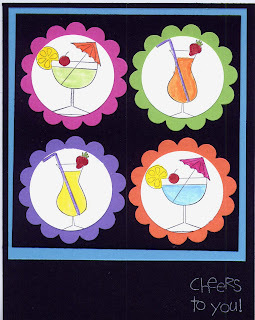 Supplies: Cheers to You stamp set, Basic Black, Tempting Turquoise, Only Orange, Lovely Lilac, Green Galore, Pink Passion, Whisper White cardstock, Whisper White Craft ink, and assorted Stampin' Write markers, 1 3/8 and scallop circle punch. I designed this card to hold a tea bag or an instant soup packet. But it could easily double as a thinking of you or birthday card too. 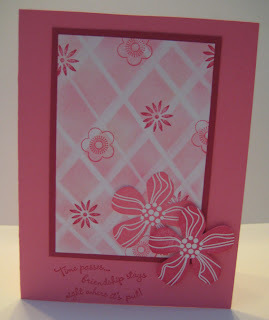 This uses the With All My Heart stamp set - much more than a Valentine's Day set! I got this card holder from my nephew's school fund raiser several months ago. Then one day I decided to hang it up, but I only put two cards in it to see that I had it secured enough. So I have been looking at it empty for at least a month. Well today was the day! I filled it with some of my recent and/or favorite cards. Now when I sit at my table and craft, I have something fun and inspiring to look at above my closet doors! Look at this flower made from a 1" x 12" piece of Designer Series Paper! 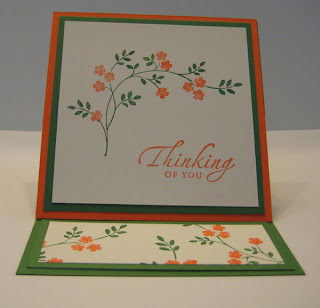 Use the Eyelet Border Punch to punch just one edge of the paper. Adhere it to a 1 3/4" circle of a Sticky Page (you could use Sticky Strip if you don't have Sticky Pages) by wrapping and gathering it around the circle. Start on the outside edge with just a little of the paper eyelet hanging over. Finish it off with a button on a Mini Glue Dot to hide the empty center. Teeny Tiny Wishes has a great assortment of small saying to add a greeting. I have seen a number of Easel Cards lately, and I decided I would try one myself. When you actually make one, it really is a quick card with a more "difficult" look. I went to an old favorite of mine for stamping - Thoughts and Prayers and used the words from Sincere Salutations. The bottom flower piece is an additional layer of cardstock to give the easel part something to catch on and stay up. I have included a side view to help give you a better idea of what the folding looks like, but it folds flat and would be a great surprise to anyone pulling it out of the envelope. This was one of our stamp club projects this month. Thanks to Julie Davison for introducing me to the technique. The Real Red, Rose Red and Pretty in Pink combo were really pretty together so I went with Valentiney colors but used flowers so it could be for other occasions too. 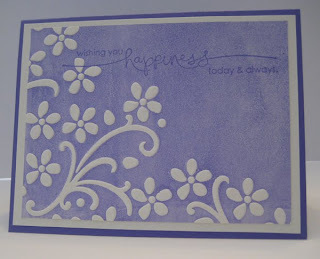 Burnish the Stampin' Pastels onto Whisper White cardstock working from darkest to lightest. When the cardstock is covered, take a straight edge (I used a ruler) and run the eraser that comes in the Pastels set along the edge. No need to be even, just straight. How's this for a Valentine? 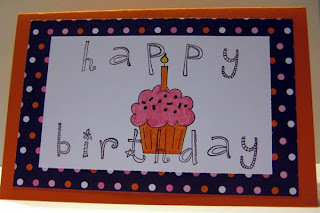 Start with a 12 x 12 piece of cardstock, score all 4 sides and fold in around your inside message or picture. (I made a template with the dimensions I liked). 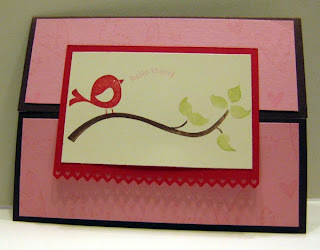 This was originally demonstrated at the Stampin' Up! leadership convention. 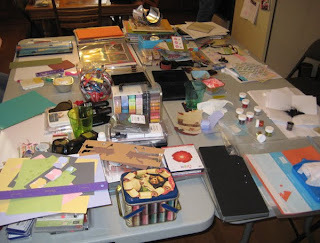 I didn't go, but I'm lucky enough to be in a group of stampers who went and shared all of their new ideas with us - thanks M.E.! Here it is all folded up - wouldn't that be a nice surprise for your Valentine? I seem to be on a Cheep Talk kick for Valentine's Day cards. We did this one last week at my Stamp-a-Stack. I think it is a good set to make a cute Valentine for any recipient. I made a few extras and will be putting them in the mail tomorrow. Last month was our last Big Shot Club meeting, and I was trying to jam in all of the great things you can do with a Big Shot before we were done. There are so many other things we could have done, but I wanted to be sure to feature this cool technique. 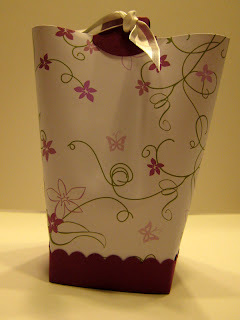 With a brayer, roll ink on the inside of the top of your embossing folder (I used Elegant Bouquet). Stick your cardstock in and run it through the brayer like normal. Since the brayer doesn’t go down into the recessed areas, there is an ink-free embossed area. A pretty cool look that's easy to do! This card features an emboss resist technique. I used the Elegant Bouquet Textured Impressions Embossing Folder which required me to rotate and run it though my Big Shot twice. If you have an embossing folder that is a full image, it is only necessary to run it through once. The Finial Press or the Perfect Polka Dots from the Occasions Mini would work great for this. I cut an oval in a piece of chipboard, used Dotto to stick it to the bottom (do not put it inside the folder) of the embossing folder and then ran it through my Big Shot like I normally do. The hole in the cardboard creates a flat area that the impressions folder can't emboss. I colored directly onto the flower stamp from Close as a Memory to put the flowers in the center creating a "frame" around them. 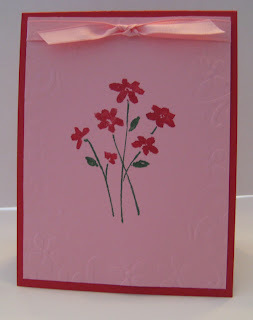 This card uses Valentine colors, but it could easily go for another occasion. This is just one of three different baby cards we will be doing Friday night at my Stamp-a-Stack using Fox & Friends. We are doing this green one, but also a baby boy blue and baby girl lavender card. It was a great chance for me to use my Perfect Polka Dots Textured Impressions Folder. The nice thing about that is that all 3 pieces of cardstock can go through the Big Shot at one time! Teeny Tiny Wishes has this little greeting to finish the card off. This set, With All My Heart, is pictured in the Mini Catalog with Valentine paper, but it is really a versatile set. 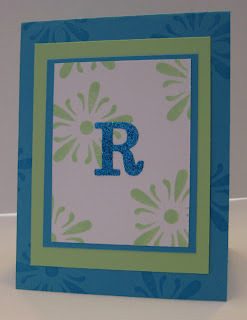 We used Sticky Pages, Timeless Alphabet Junior Sizzlets, and Fine Supernova Stampin' Glitter in Big Shot Club. Punching the letters out was a little tricky, but I think the glittery monogram is worth the effort. Cottage Wall has been my favorite Designer Series Paper since the new catalog came out in July. You name it and I have made it using Cottage Wall paper. This little bag in a box is a great way to hold treats of any kind. It's a perfect size for chocolate covered popcorn - enough to feel like a treat, but not so much that there won't be leftovers for me!